Luke Langholz Pottery: All About Music, 2011 Edition. Well, it only took me a month two months three months! to getting this post up. Would you believe me if I told you I started it before Christmas? But then there was more music, and life happened, and some pots, and here we are. I've not been as busy in the studio as I'd like to have been the last couple of weeks, but sometimes we just have to take what we can get. And what time I have had has not been well documented. I've got a handful of pictures from my phone that will probably make it up here, and often are shared (in real time!) on Twitter. In the meantime, I thought it best to post the following little ditty before any more time has lapsed it into irrelevance. Before you know it I'll have my own opinion about 2012 (assuming we're all still here next January). See? 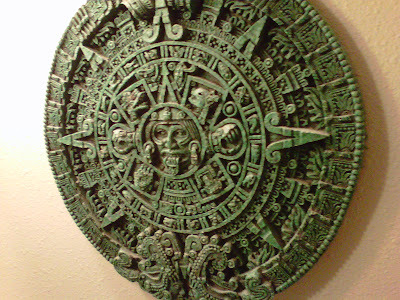 Our calendar stops after 2012. 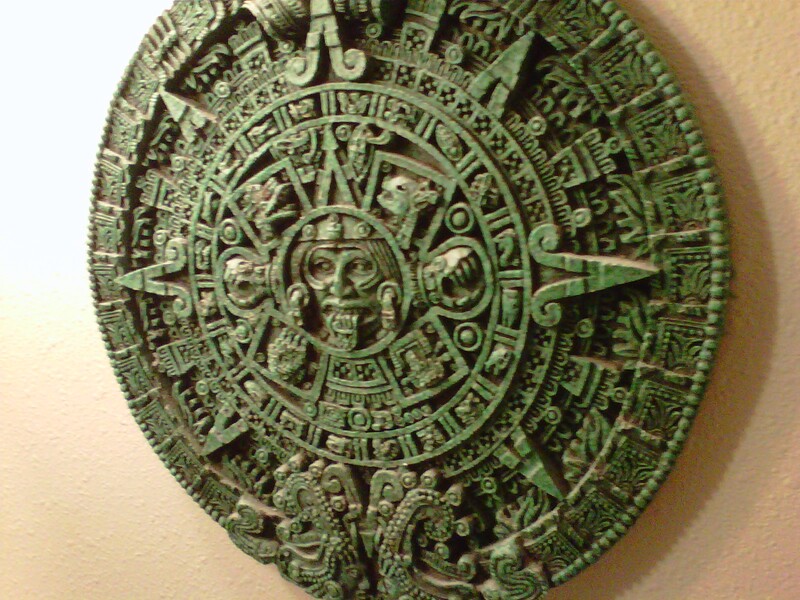 I mean sure, it's Aztec, not Mayan, but it clearly doesn't cross a day into 2013! I'm aware that this is completely self indulgent and primarily for my own enjoyment, but I hope you enjoy it, too. Please feel free to tell me what I got wrong, what I got right, and what I missed out on. What was your favorite music of 2011? Was it a new artist? An old favorite with a new release? Heck, I don't care if it was new music. If it was new to you, I'd love to hear about it. Always looking for new tunes, that's me. If you're not at all interested in my taste in music, come back soon - I'm sure there's pottery on the horizon. If you care to indulge my fancy, stay right here. There was a whole lot of good music going on this year. I scrolled through my media library pulled over 30 albums released in 2011 that Krystal and I added to our collection over the course of the year. Which really isn't all that much. But that's only counting full length albums. Not counting EP's (otherwise The Hawk in Paris's "His & Hers EP" would be on this list). Or live albums or or compilations or samplers or all the music that I'm intrigued by but haven't had the chance to pick up or fully give their due. It's also worth distinguishing here that my aim is in no way to present an authoritative statement on the status of music in 2011. This list serves to represent the albums that I have most appreciated this year. Not a “best of” so much as a “my favorites.” Also, with after filling the top two slots the ordering is pretty much a wash. Because there was just that much good music this year. Finally, in what is a first here (guest writer! ), my lovely wife, Krystal, has kindly offered to share a rebuttal of sorts with her very own favorites from the year to follow below. Mutemath – Odd Soul: Groovy, soulful, ripe with vintagey organs and funky basslines. From the lyrical content to the rich instrumental arrangements, Odd Soul kept me coming back for more. I don't think I could argue that this was objectively the best record this year, but it came out on top as my favorite in a year with some phenomenal releases. Top Tracks: "Blood Pressure," groovy "Quarantine," album closer, "In No Time." Foo Fighters – Wasting Light: A close 2nd-place. It's the same straight-up rock we expect from Grohl & Co., with the added bonus of some very serious lyrical soul-baring. Nearly a year later I still can only listen to this one start-to-finish, no skips. That's saying something. Top Tracks: "Bridge Burning," "Walk." Foster the People – Torches: We heard their first single, “Pumped Up Kicks,” early last spring on an iTune's radio stream out of Cleveland while painting our kitchen and had a shared “What is this?” moment. The rest of America soon followed. I'm not going to say we were the first to jump on the wagon, but we might have been the first in the state. Torches is synth-and-bass driven rock from a veteran commercial jingle composer, so every song gets in your head and stays there. Seriously: so good. Top Tracks: "Kicks," "Houdini," "Warrant." Switchfoot – Vice Verses: I thought this was a contender for the top spot on this list, and the fact that it isn't is more a testament to the competition than to detract from Switchfoot's merits. That and the fact that 2009's Hello, Hurricane set the bar high in expectation of a follow-up. Very strong mix of crunchy rock and heartfelt ballads (psalms?) from the San Diego band. Top Tracks: rocking "Dark Horses," pensive "Souvenirs," worshipful "Where I Belong." The Black Keys – El Camino: I should've gotten on this train long before 2010's Brothers, cause this blues duo comprised of two pasty white guys from Akron is amazing. Got to see them live last summer and there are no words. I've seen 5-piece metal bands that don't have half the energy these two give on stage. Bluesy rock of the first order. Top Tracks: "Gold on the Ceiling," "Little Black Submarines," "Hell of a Season," the other 8 tracks. Fleet Foxes – Helplessness Blues: Alt-folk is what some call it. I call it magic. Harmonies to make The Eagles jealous. If you're not a fan yet, put the title track on, close your eyes, and try not to be moved when the song hits its climax. You'll know. Oh, you'll know. Top Tracks: best served whole, but "Helplessness Blues" converted me when it was a free single on iTunes - 3 months before the rest of the album dropped. The Civil Wars – Barton Hollow: More folk. This married-but-not-to-each-other coed duo has been making waves since they started singing together. Beautiful, expressive. Often just a guitar and two voices, occasionally piano - songs of love and life. Ugh. Top Tracks: "Barton Hollow," "Poison & Wine," "Birds of a Feather." Radiohead – King of Limbs: I was non-plussed when this first released because of its short length (8 tracks?) and inaccessible vibe. A long, slow burn later, I've decided to read this as electronic jazz for the new decade. Blips and beeps and warbles and droning grooves - moody, atmospheric, even groovy at times. I guess I just wanted it to sound like other Radiohead. Which is the point, I suppose, for a band that's been trying to buck expectations ever since they made it big. Top Tracks: "Morning Mr Magpie," "Lotus Flower," "Codex." Wilco – The Whole Love: I suppose I should start by saying I'm not a Wilco fan. But I like this album. Poppy at points, experimental at others, this record made for a great listen, enough so it made it onto my list. Top Tracks: "I Might," "Dawned On Me," "Born Alone." Coldplay – Mylo Xyloto: I don't suppose there's a whole lot to say about Coldplay these days. They write catchy, anthemic "rock" songs that dominate the airwaves for months on end. This really is a good record, even if not as great as it could have been. Half the record is synth-happy dance music, the other is soft, acoustic driven tracks that could be B-sides from 2005's X&Y. Top Tracks: "Paradise," "Major Minus," "Up With the Birds." The Kills - Blood Pressures: A late arrival on the list. Part of the reason I never post these year-end deals is that I spend the first couple months of every year catching up on music I missed during the year in question. These are normally relegated to the honorable mentions, but given the end of 2011 I thought I could fit eleven records on this list. It's bluesy and dark, like an electrified after-hours version of the Civil Wars. This music sounds dangerous. Top Tracks: "Future Starts Slow," "Pots and Pans," wrenching waltz "The Last Goodbye." Honorable Mentions (in Alphabetical order): Bon Iver, Bon Iver; Burlap to Cashmere, Burlap to Cashmere; Danger Mouse & Daniel Luppi, Rome; David Bazan, Strange Negotiations; Death Cab for Cutie, Codes and Keys; Feist, Metals; Raphael Saadiq, Stone Rollin'; The Roots, Undun; The Strokes, Angles; Yuck, Yuck. "Krystal's Picks: Her Favorite New Releases of 2011"
Adele – 21: I refuse to not put this at the top of my list just because everyone else in the nation likes it, too. I did that in middle school when I refused to wear my Doc Marten sandals because everyone else was, even though I really liked them. This is me being mature enough to put it at the top of my list, too. AND I feel if only because it's comforting knowing there's good music out that the general public appears to like as well. Ed. Note: Hard-boiled editing was required to get her rambling comments down into this concise opinion. Britney Spears – Femme Fatale: Mostly I'm torn between my intense love of this album and the knowledge it is really very bad music. Ed. Note: almost made my honorable mentions list. It's pretty awful, and pretty awesome. Cake – Showroom of Compassion: Is it Cake? Then it's awesome. The Black Keys – El Camino: Given the choice, I'd just as soon listen to (2010's) Brothers. But this is still really, really good. Krystal's Honorable Mentions (in Alphabetical order):Bon Iver, Bon Iver; Death Cab for Cutie, Codes and Keys; Feist, Metals; Fleet Foxes, Helplessness Blues; Mutemath, Odd Soul; Radiohead, King of Limbs; The Roots, Undun; Switchfoot, Vice Verses. And that's it. Stop back soon for something more pottery related, hopefully.